First of all, we want to note that we are in no way paid to say these foods are our favorite. Any affiliation we have with these dog food companies is because we CHOSE to be affiliated with them. 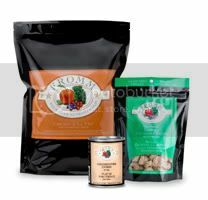 We want to be able to bring our members special offers and prizes from these particular foods, because we would love for each and every person who reads this page to try these foods. We have had many dog food discussions on our sister forums and great helpful advice from many members. Visit our Nutrition forum to post any question you have relating to this article and your experience with dog food. With Thousands of choices, how do you choose???? Below is our Top 5 Dog Foods We Recommend and Most Importantly- Why. The first thing I wish to bring up is your dog's immune & digestive systems. When you feed your dog a poor diet, their immune systems are compromised. While the common population of Bulldogs suffer from allergies, what you don't know is that if your pet has a low immune system, this could the source of most- if not all- of their allergy problems. Recent studies also show that giving your dog the same protein everyday can also cause specific protein allergies. This is why it is actually good to switch your dogs food, trying different brands and proteins. Once you get your dog on a high grade diet you can actually switch more freely without causing digestion and stomach upset problems. You may also be able to identify possible protein allergies. Probiotics and Prebiotics help improve digestion, and are very important. But you must not be fooled by television advertisements. Almost all dog foods claim to carry these, but if they do, what benefit do you get if all the other nutrition in it is garbage? How much do they put into the food? There are few that provide this guarantee in writing under the guaranteed analysis showing HOW MUCH they put into their foods. What you may not know is that most dog foods are not made with real quality human grade muscle meat- they are made out of rendering plants that use such 'meats' as road kill and euthanized pets! Dog food labels are very vague. There are just not enough laws when it comes to pet food labels. Hopefully soon these laws will change, but until then it is up to those who know how to read the labels. Linda actually calls the manufacturers of dog foods and does a full investigation and asking for information that is NOT on the labels. Cooking times and temperatures. Where they get their ingredients. Many foods are heated at too high of temperatures so the nutrients are all cooked out. Do they use natural vitamin sources or synthesized vitamins? Again, it is important to us here at French Bulldog News that you know and understand that we are not getting paid to tell you we like these dog foods. We are going to continue to spread the word about dog nutrition, and we recommend these foods because we believe in them. Any affiliation we have with them sponsoring our contests or offering coupons is to benefit our members and guests, because we want to see you all make the decision to get your dog on the best diet available to you. We contacted each of these companies to see if they can provide us with these things for you, our wonderful members and guests of the site. What changes should you expect to see with a better diet? REMEMBER TO SWITCH SLOWLY AND WHAT WORKS FOR ONE FRENCHIE MAY NOT WORK FOR YOURS. Fromm 4 star foods are interchangeable. Meaning your dog can have Turkey al la veg one night, and beef the next. They do not overcook their food so the nutrients are not cooked out of them. Their "grain free" foods and treats are excellent for bulldogs with allergy problems. They put their probiotics and enzymes in the Guaranteed Analysis. Many with bulldogs find success with Beef Frittata or Pork & Peas so those are two good choices to try. Nature's logic is made with 100% natural ingredients. No man made, chemically synthesized vitamins, minerals or amino acids. No chemical preservatives, artificial color or flavorings. Gluten Free Dry Kibble & Treats, Grain-Free Canned and Raw Frozen. No corn, wheat, soy, rice, potato, tapioca or glutens. Contain probiotics and enzymes. Great for bulldogs with yeast and allergy issues. Because of the high quality ingredients in this food, stool can become hard, so keep in mind you may need to add water to it should this happen. The Nature's Variety Instinct line of foods has absolutely no gluten or grains. It also does not have potatoes/sweet potatoes or sugars which can be a problem for some bulldogs due to the link of potatoes causing yeast. The instinct line comes in RAW form as well and the whole instinct line is formulated to be interchangeable. This food is a great choice if you have an ongoing yeast or allergy issues. The only drawback is the amount of protein in this food. Make sure you do not over feed your bulldog this food and give them plenty of exercise. Because of the high quality ingredients in this food, stool can become hard, so keep in mind you may need to add water to it should this happen. Founded in 1999, Petcurean Pet Nutrition is a Canadian-based, family-owned company, based in Chilliwack, British Columbia, that's dedicated to selling nutritionally balanced, unique pet food recipes made with high quality, natural and fresh ingredients. High Quality ingredient panel, grain free options. Excellent variety of choices depending on your bulldog's needs. Champion pet foods stands apart as an award-winning, independent Canadian pet food maker with a reputation of trust spanning more than a quarter century; unlike today’s multinational and marketing companies that sell – but don’t actually make – pet foods. These are not our top choices but we also wanted to recommend a couple of foods from Pet Retailers like Petsmart/Petco. 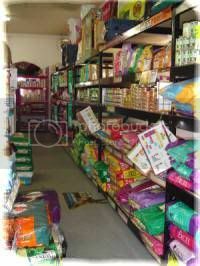 Many of our recommended foods can only be found at feed stores or specialty pet stores. 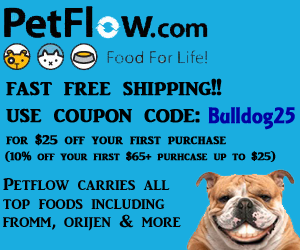 However, you can easily order any of our recommended foods from Petflow with no sales tax and FREE SHIPPING! Why? AvoDerm is NOT the best, but this is the only food we would recommend that is easily accessible and found at a pet retailer. Please note that if you have a bulldog with allergy problems, this food is not grain-free, (but it is wheat, soy & corn free). Not only will your bulldog love this food (it smells terrific), but your pet will also smell good, and the coat will be shiny and healthy. We have had great results with AvoDerm. However, this is not the best choice for bulldogs with allergies. They also have a vegetarian formula for dogs who have problems with proteins. Blue Buffalo Wilderness is considered a premium quality dog food with quality ingredients and rated six stars on our food ratings scale. The Blue Basics formulas are limited ingredient diets and can really help you identify food allergies. Although not the highest rated, Blue Basics may be the best choice for you if you have an allergy prone bully. 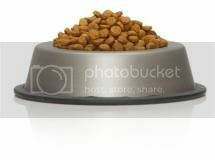 What most pet owners don't realize is there are more options than just "Kibble". Many pet owners are now choosing to give Home Cooked meals or Raw Diet because of health and skin issues they had with feeding processed "kibble". Please check out our Home Cooking and Raw Diet forums HERE. For those who don't feel they would be comfortable doing those types of diets, there are other options. Here is a few of them. Grandma Lucy's was originally developed back in 1999 for a dog named Lucy. She was very picky and had allergy problems. This food is highly recommended for those who wish they could try a raw diet but just don't have the time or the stomach for it. With several choice proteins to choose from and the limited ingredients, lack of grains, this is worth a try for anyone battling food allergies. The Honest Kitchen is human grade food made at a human grade plant, good for dogs with allergies, has a lot of protein choices. They have been in business 10 years. They have a plant that produces human grade food and their produce has not been genetically altered. Stella & Chewy's believes that dogs and cats deserve to thrive on pure, simple, minimally processed food – the way nature intended. That’s why their natural dinners aren’t cooked like most commercial pet foods. And why every patty is made with select organic produce and raw, USDA-inspected meat. Yep that is right, with all of these choices you will get a bowl full of meat, veggies and more, just add water. Like home cooking or raw diet, without the 'fresh' part. A great way to do raw diet with fruits and veggies without the hassle of packing, freezing, thawing, or cooking. This food is an excellent option for those with particularly busy schedules but want to give their pet a top notch diet. Is taste of the wild dog food a good selection?? Yes BamaGrommer is right, this is helpful to get a lot of information about dog food. Hi, We recently brought our baby girl home and was recommended to give her Wellness Core Puppy Grain free. So I purchased a small bag to try from our local petsmart. What do you think? Thanks so much!! !